My wife keeping stats of every pitch, she's getting very good. Keeps stats on everything, from every pitch from both teams, that's my girl! Our leftfielder pulled him hamstring, so we had to wait for him to go in and get it taped. 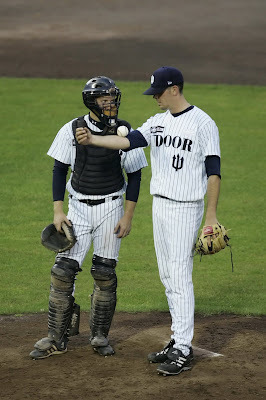 This is Lennart, our backup backstop and I just chatting and messing around on the mound in the 6th. 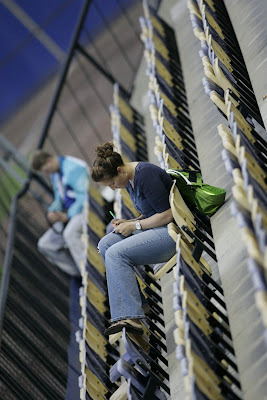 This picture made the front page of the main dutch baseball website. We won our 9th game of the young season in a makeup of a makeup game thursday. I got the start due to missing a weekend being back home in Canada. which means I actually started 2 of the 3 games of the series vs. the #1 team in Holland, and Europe, Kinheim. We won 5-2, I went 7 innings, 101 pitches, 6 k's, a few walks and a couple guys hit by pitches, but they deserved it though. Kinheim's lineup is filled with national team guys, which makes it more of a challenge, because it's more of the caliber that I would face at an international level, such as the large upcoming tournaments this summer. So I enjoy getting up and being at the top of my game being able to face them, and on top of that win. Our game today has been rained out. We we're to face the 2nd to last team in the league twice this weekend, but rain has created a bit of a lake on our infield, so no playing today. Instead, shorty and I are heading south, to Belgium, to see a game of my former team, the Hoboken Pioneers. I called ahead to the manager of the team to make sure they haven't yet been monsooned out, and I could hear the crack of softball bats in the background, and he said it was good enough and should be a go this afternoon, so we're heading out soon. Should be about 1:15 hr drive, which means about 45 Euro in gas for the trip (70 canadian for 2:30 hours of driving in a car, not even an SUV... crazy). But it's definetely worth it to see all my former teammates play again. Specially because they are on top of the league, and facing #2 today. Rain rain stay away, we want to see some freakin baseball today. Hi Leon, nice to see that you are using the photos I'd send you. If you want some more pics, jnust let me know. 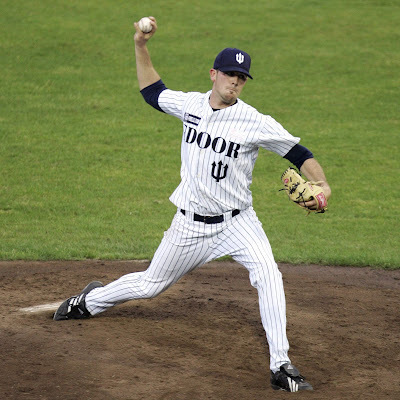 Oh .... if your readers want to see some cool baseball pics just look @ www.jelsma.tk or www.honkbalsite.com. See you soon !